The Galaxy S6 Edge is unique. It’s different. It’s not quite like any phone you’ve used before. But it takes an already expensive phone and makes it more expensive for no real practical benefit. 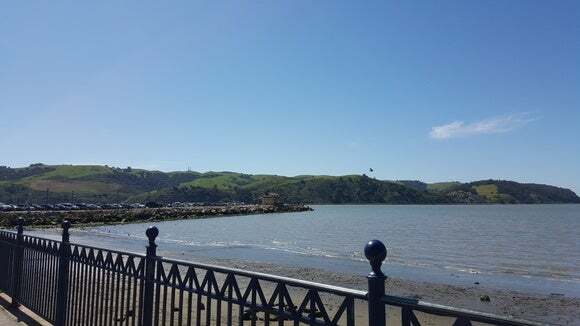 At least it’s pretty! Unlike the rest of the boring, flat phones out there on the market, the Galaxy S6 Edge features curved edges on either side of the display, though there’s little benefit to this interesting design. Like an expensive purse or a pair of red-heeled Christian Louboutins, the curve is mostly there for vanity. You might be wondering: Why didn’t Samsung just release this as its flagship device? Why even bother with two models? This is Samsung’s way of flailing its arms around and saying, “Look at what I can do!” It wants to convince you that it’s capable of producing something even more interesting than Apple’s same old iPhone. It certainly does turn some heads—I received plenty of stares while using this phone out in public. It’s certainly impressive, but I’m not entirely convinced that it’s worth the extra $100 you have to pay over the price of a standard Galaxy S6 (it starts at $779, instead of $679 for the flat GS6). Here’s how it looks in the palm of your hand: just like the Galaxy S6. While the display curvature is totally and completely unnecessary, the Galaxy S6 Edge truly is a beautiful phone. It offers a look and feel that’s unlike any other smartphone you’ve held. It’s not lopsided like the Galaxy Note Edge, either, and it feels good to hold. Like me, you’ll definitely get some double takes when you bring this out phone around friends. I did feel weird using the Galaxy S6 Edge because it doesn’t feel the same in your hand as a standard phone. I had constant anxiety about using it; sometimes it felt like I would accidentally launch an app or tapped I didn’t mean to. But the software only registers when you swipe from the edge inward, rather than tapping around the borders, which would explain why when I was cradling it, it wasn’t just launching apps willy-nilly. That display’s got a curve! Yes, there it is: the curve. The interface on the Galaxy S6 Edge doesn’t stop where the curve starts. Rather, it bends over at a 35 degree angle, as if it’s cascading down back into the chassis. Notice how it’s a bit brighter around the curved edges? At times, those parts of the screen appeared a bit brighter than what was happening on the rest of the display. A bend in glass will simply cause light to diffract, plain and simple, and sometimes this impacts the apparent brightness or contrast of the edges. It didn’t bother me, but it is irksome that Samsung wants you to pay extra money for this new technology it’s apparently still figuring out. The Galaxy S6 Edge lets you designate up for five contacts for its People Edge feature. If its looks can’t entice you, maybe People Edge will. The feature lets you designate up to five contacts for quick access by swiping in from the right edge of the screen. The five contacts are each be color-coded, so that when the device is face down, the curved sides will glow in the appropriate color to signify who’s calling. While it’s face-down, you can tap the heart rate monitor to dismiss the call and send a canned text message reply. The pink glow means my beau is calling me. People Edge—or Edge Lighting, which is what it’s called when the phone lights up while it’s face-down—is a neat feature, but it’s not something that I would personally use. However, if you’re one of those people who is always glued to their phones and tends to leave it face down on the table next to you you while you’re in meetings, you might find it helpful. The text message my beau received when I tapped the fingerprint sensor to dismiss his call. The Galaxy S6 Edge also offers a Night Clock, a feature that was carried over from the Galaxy Note Edge. It displays the time at night along the phone’s curved edge without disturbing you, and lets you know when the next alarm is. It also notifies you of incoming calls, text messages, and emails. Night Clock tells you the time and when you’re due to wake up. These features are definitely helpful, but I don’t know that they’re worth the extra $100. You could very well fake some of these with several apps from the Google Play Store for no more than a few bucks. The Galaxy S6 Edge is just the Galaxy S6 in a curvier body. 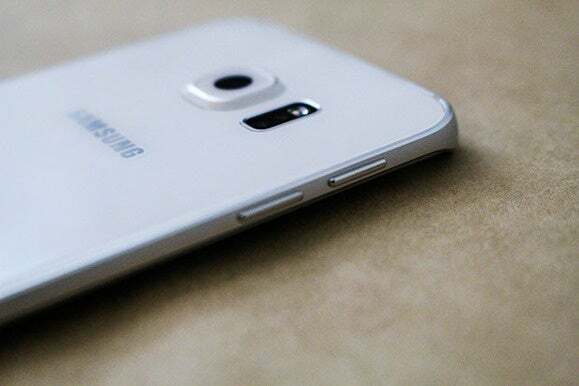 The Galaxy S6 Edge is the Galaxy S6 in a curvy chassis. It features the same fingerprint sensor embedded in the Home button, as well as wireless charging compatibility, supporting both Qi and PMA standards. Bottom facing speakers for pumping the jamz. Sort of. It also features the same 5.1-inch QuadHD Super AMOLED display—except that it’s curved on the sides—and is powered by the same 64-bit Exynos 7 Octa 7420 processor and 3GB of RAM. 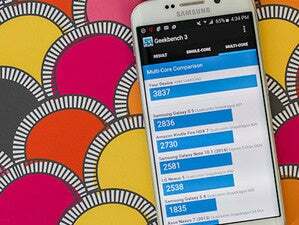 It’s the first time Samsung’s bundled its own processor with the U.S. variant of its flagship device, which is why we took the time to vigorously put it through its paces. 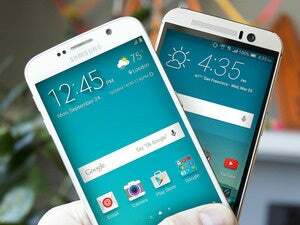 We also wanted to see if there was any performance difference between the curved Galaxy S6 Edge and its flat sibling. 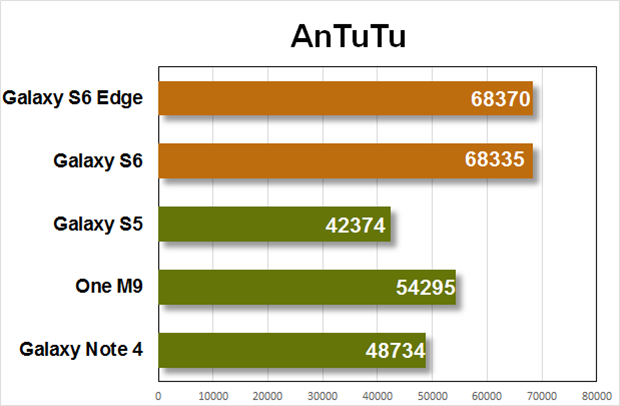 AnTuTu tests overall device performance, including user experience, which the Galaxy S6 Edge also delivers on. It’s neck-and-neck with its flat counterpart. 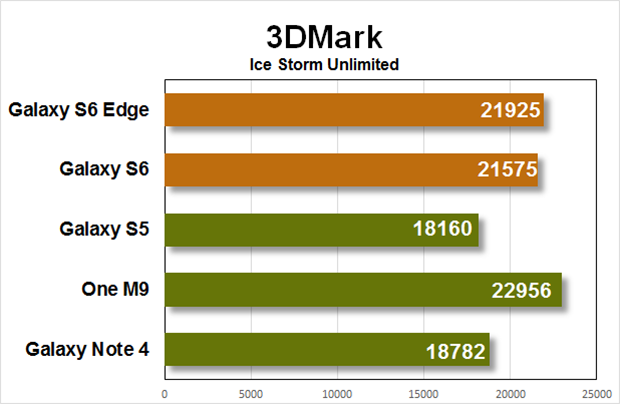 The Galaxy S6 Edge performed relatively well in 3Dmark, though this was one area that the One M9’s Qualcomm Snapdragon 810 succeeded. 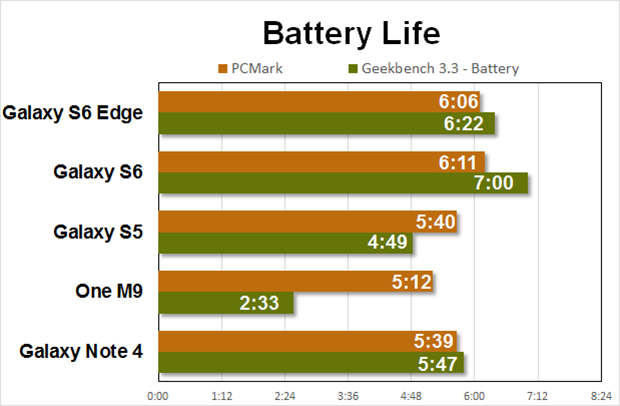 As our benchmarks show, the Galaxy S6 Edge is seriously fast, and in some instances it actually beat out the Galaxy S6 by a tiny bit. We can’t explain why, though; either the processor is clocked just a tad more on the Edge, or it runs a bit cooler overall. The Galaxy S6 Edge will get you through a day’s worth of work—and if it’s dying, you can always quick charge it in just 15 minutes. 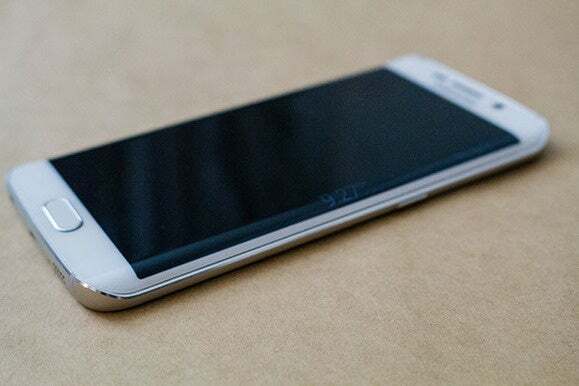 The best feature about the Galaxy S6 Edge is not its curved screen, but its battery efficiency. It sports a 2600mAh battery pack (ever-so-slightly larger than that in the Galaxy S6) with fast charging capabilities that are a boon when you’re in a battery bind. I left the Galaxy S6 Edge on my dresser for a whole weekend and it only ate through 20 percent of its battery life on standby—and that was with it receiving notifications and app updates. Like the Galaxy S6, however, it uses up a lot of juice with the screen on. Rest assured that when it’s off, it’s basically hibernating. 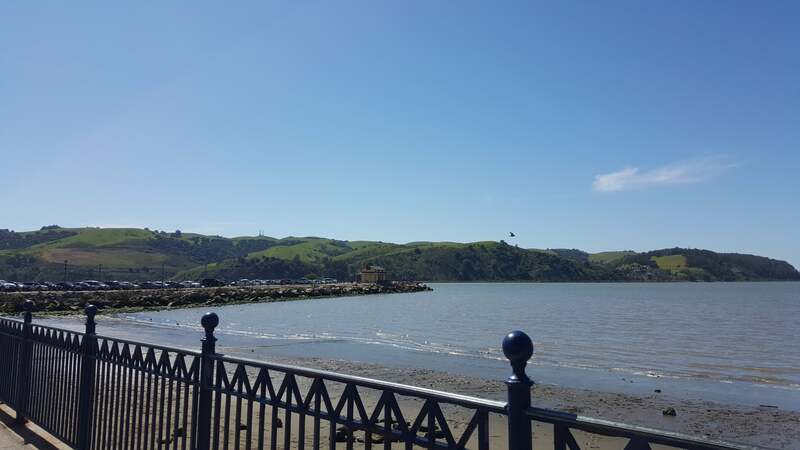 The same great 16-megapixel camera that’s in the Galaxy S6 is also in the Galaxy S6 Edge. The Galaxy S6 Edge comes equipped with both the 16-megapixel rear-facing camera and 5-megapixel front-facing camera that’s featured in the Galaxy S6. It was just as consistently great and as fast as its flat counterpart. A scene from SOMA in San Francisco. 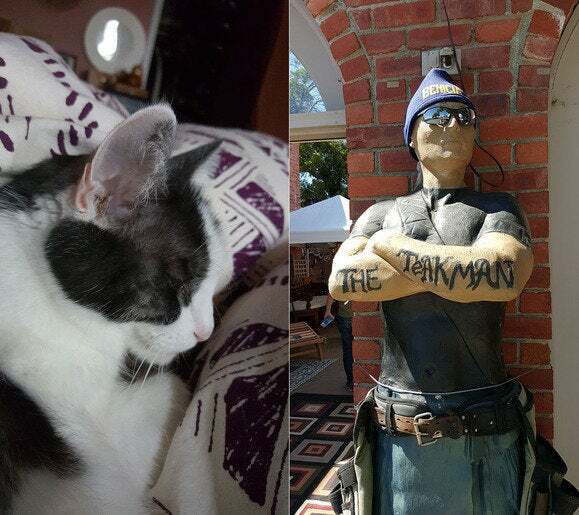 My cat indoors, and the Teak Man outdoors. 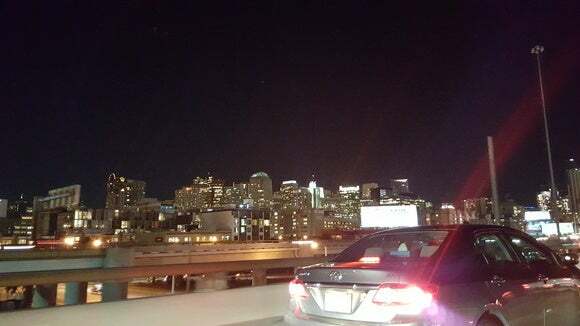 Yes, it’s a gnarly photo taken from my car, but it’s also an example of how good the low-light performance is on the Galaxy S6 Edge. You won’t get this kind of detail from a night shot on other smartphones. It’s phenomenal at taking scenic shots, group shots inside the bar, night shots out in the city, or wide-angle selfies with the family. If you want to see how it performed out in the real world, you can see our shootout against the iPhone 6 Plus, or check out the review of the One M9 to see how it fared against HTC’s flagship. What do you think? Is the Galaxy S6 Edge worth the extra $100? But I’m still stuck on that price point. 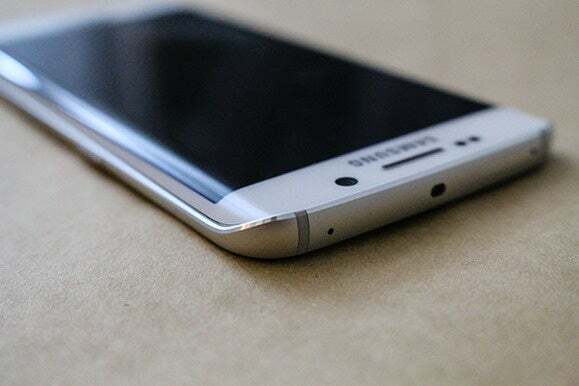 The Galaxy S6 Edge could very well end up being cheaper in the coming months as both carriers and Samsung slash prices, but right now it’s just costs too much for the added novelty of curved edges. You can pay the extra money for this pretty device, but you’re not gaining much more functionality. If you’re really attracted to this phone, I say wait a bit until it falls in price, because its beautiful design isn’t worth breaking the bank over. The Galaxy S6 Edge is all beauty and brains, but you should only spend the extra cash if you absolutely want the novelty of a curved edge.